Jentezen Franklin is the Senior Pastor of Free Chapel, a multi-campus church. Each week his television program Kingdom Connection is broadcast on major networks all over the world. A New York Times best-selling author, Jentezen has written eight books including the groundbreaking Fasting and Right People, Right Place, Right Plan. Having a passion to serve others and foster unity, he was awarded the Martin Luther King Jr. Mantle of Destiny Award for his work and efforts for racial reconciliation. Jentezen has served as an advisor to CEOs and business leaders of multiple organizations and is listed among notable alumni at Barton College in Wilson, North Carolina. Additionally, he has served on an advisory board to the President of the United States. Jentezen and his wife Cherise have been married thirty years, have five children and two grandchildren, and make their home in Gainesville, Georgia. 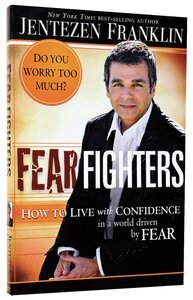 Customer Reviews For "Fear Fighters"
This book is so well written, and challenges the way we often think. J. Franklin uses God's word to demonstrate how we can push back worry and fear, and live a life that depends on God in every area. It was a really refreshing read, that I know I will revisit.